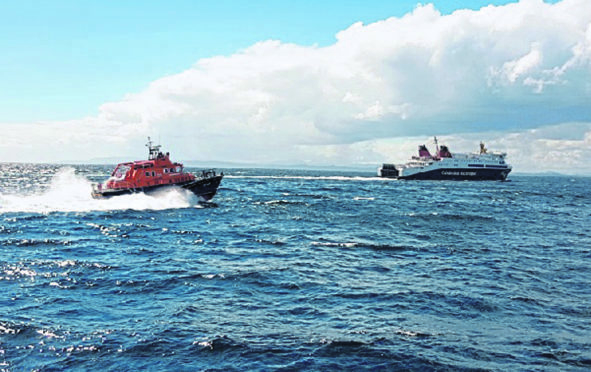 The breakdown of a CalMac ferry in the Minch has triggered renewed calls for an Emergency Towing Vessel (ETV) to be stationed at Stornoway. The MV Loch Seaforth, the firm’s largest vessel, suffered engine difficulties and a power outage halfway to Stornoway on Wednedsay, with 343 passengers and crew enduring five-and-a-half hours at sea instead of the usual two-and-a half. Western Isles MP Angus MacNeil has now called on the UK government to reinstate an ETV at Stornoway to service the west coast. Since 2012 there has only been one tug – the Ievoli Black – patrolling the north coast. It is based in Orkney, but it also has to cover the Northern Isles and he argues it could be overstretched in an emergency. Mr MacNeil said the ETV that had been based in Stornoway was removed in 2011 as a “cost cutting exercise” by the UK Government. The MP has issued repeated pleas for a tug to be stationed on the west coast and in 2016 presented a petition launched by local councillors Rae Mackenzie and Gordon Murray to Downing Street. In February, the rudder of the 1,200-tonne cargo vessel broke in the Kylerhea straits, the Kyle and Mallaig lifeboats held it in tow until a locally-operated tug was able to pull it to safety. RNLI lifeboats again responded to when a Norwegian cargo vessel suffered engine failure near Taransay in December last year in gale-force winds – the ETV did not arrive from Orkney until the next day. Ferry services between Ullapool and Stornoway were severely disrupted following a CalMac ferry losing power during a crossing on Wednesday. The MV Loch Seaforth lost power just over an hour into the 10.30am sailing from Ullapool with 343 passengers and crew on board. In its firts amended timetable issued by the ferry provider all sailings were delayed by at least six hours on Thursday with more delays expected throughout the weekend. The first service of the day was due to leave at 7am from Stornoway but that was put back to 1pm. CalMac advised those wishing to travel to “secure passage” by start boarding at 9.30am as check would close at 11am. But it left 45 minutes late triggering even more delays throughout the rest of the day’s sailings. It was expected to arrive in Ullapool at 3.30pm but was late due to its late departure with the return journey to depart at 4.30pm – normally that service would depart at 10.30am. A second amended timetable saw the 10.30am service finally leave at 5.15pm and it was expected to be in Stornoway at 7.45pm. The 2pm return service to Ullapool was scheduled to depart at 8.45pm with an estimate arrival of 11.15pm. Foot passengers on that service arriving in Ullapool were advised to alert either CalMac or Citylink before departing Stornoway if onward bus transport to Inverness is required. The last crossing of the day will depart from the mainland at will now only leave at 12.15am and is only due to arrive in Stornoway harbour at 2.45am. Western Isles MSP Alasdair Allan welcomed news that the MV Loch Seaforth was repaired back in service but regretted the delays. He said: “There remain passengers who were inconvenienced through the night, and many others who will suffer delays today as the ferry service gets back to normal.